The Jaguar XJS is a handsome grand tourer with an unreliable and expensive V12 or I6 under the bonnet. Owning one requires a relationship with your local Jag mechanic, even if you are handy with DIY, you still need a constant supply of used-but-functioning switches for anything electrical that needs to have electron flow shut on/off. Replacing the Lucas fired V12 with a domestic V8 is a logical step to getting some of the routine maintenance under control, but you need to finish the job before you get sidetracked by harvest time. 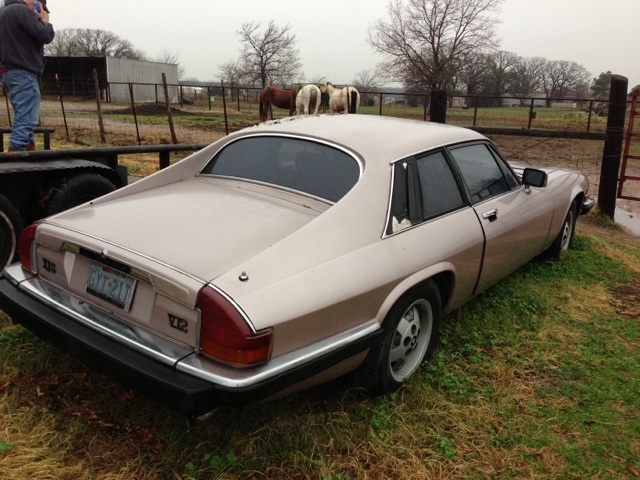 This 1983 Jaguar XJS with Chevy V8 is located on a farm in Dallas, TX and is bidding on ebay for $766 with a few hours to go. The XJS is a sleek machine and looked quite nice for the day - compare it to a similar era C4 Corvette or e24 6-series and the Jag is the prettiest of the bunch...akin to being the nicest hay bale on the prairie, but in a analog world, point of reference means everything. The flying buttress rear end treatment was controversial for the day, but we find the effect to be pleasing to the eye, especially compared to the later jelly bean shaped XK8. You could bring some sort of towing device out to the field where this partially complete project has been put out to pasture...but with some tools and a few laps around the lunging ring, we bet you could ride this cat home. ~ WTF? STEAL THIS CAR!! i've been a fan of Jags That Run and Stealth Conversions since i first got the conversion manual in the early '90s. 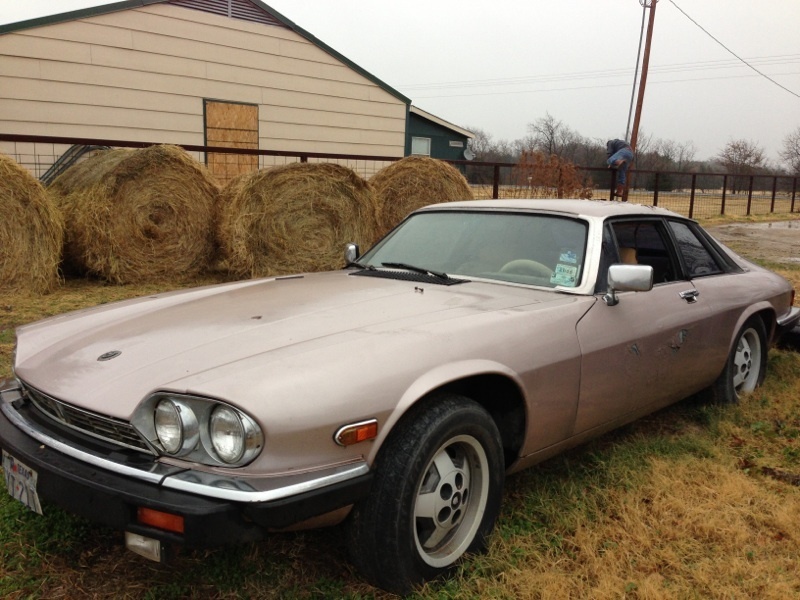 i've driven a number of XJS and XJ6 cars with GM V8s and feel they are a tremendous value in budget hot-rods. i hope some lucky DT reader pulls the cord on this! ~ TWELVE HUNDRED DOLLAR$ !! great purchase. The domestic v8 swap seems perfect for the gentlemanly muscle tourer that these always were; they were clearly never sports cars. Great shape to these, too. Looked so fast just sitting there. Headlamps on these were soooooo much better than the later wide-eyes. *cries* Why didn't i see this yesterday? I'm local and everything. ~ oooo, @ Shane S - heartbreak. 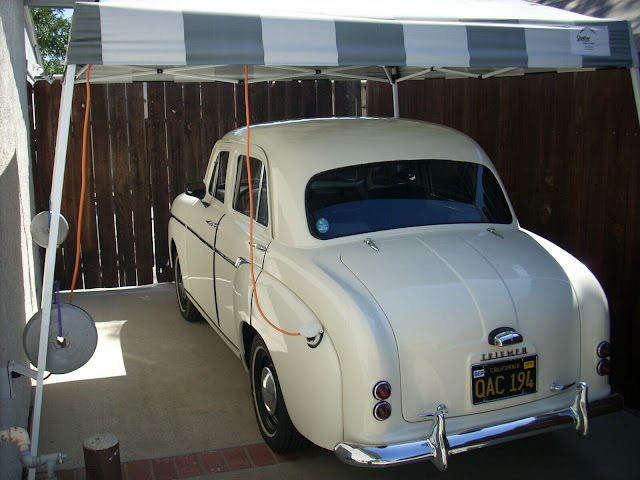 there must be 3 or 4 times the hammer price just in small parts .... without peeking inside or under the hood. but keep your finger on the pulse - there will be another. in TX you're right in the pocket.